Monkeys are the most widely scattered primates around the world after humans, and they never cease to delight with their antics - as opposed to humans. Monkeys are the most widely scattered primates around the world after humans, and they never cease to delight with their antics - as opposed to humans. From a few inches to several feet tall, there are some 260 species in all. You'll meet them in Africa, Asia, Central and South America, even in Gibraltar where the so-called Barbary apes are actually macaque monkeys. 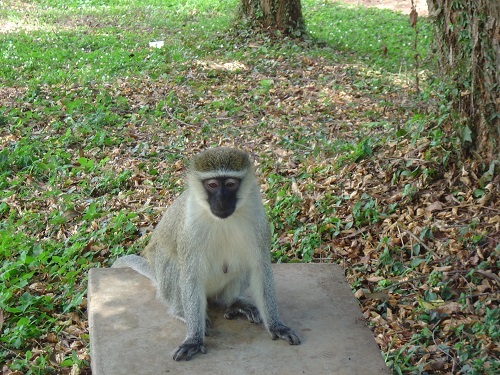 They come in various shapes and colours, from the red colobus to the olive green baboon, with a whole variety of quizzical faces and an entire monkey-medley of peculiarities - from the Proboscis with the dangling fleshy nose for males, to the Vervet with the strikingly blue balls. Males seem to have all the fun in the outrageous world of monkey fashion! 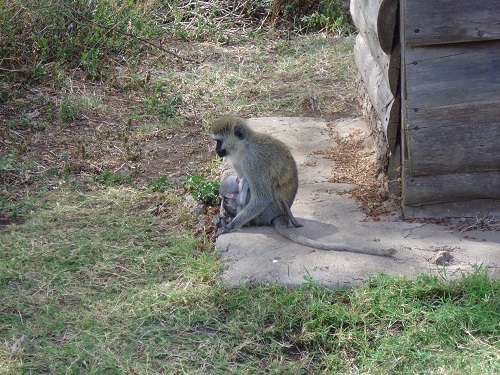 Here are just some of the inmates encountered on Looney Front trips - unfortunately I don't seem to have any of the Vervets' blue scrotums or is that scrota? This strange-looking creature with a long, fleshy, tubular nose and a pot belly is found only on the island of Borneo, on both the Indonesian and Malaysian sides. And no, Dutch Monkey is not the name of a riverside pub here in Indonesia's Central Kalimantan province. It's what the indigenous Dayaks took to calling it (sometimes just Dutchman), since they found a striking similarity between it, with the male's four-inch-long proboscis hanging over his mouth, and the big noses and fat bellies of their new colonisers way back when. Here on the Sekonyer River, hordes of them are swinging breathtakingly from tree to tree, posing on high branches as they look down at us, squinting down their long, long noses with total contempt - think of a board meeting of your favourite company or organisation. Now one group's chasing another and generally horsing around, if monkeys can horse around - to mix species. These are the most widespread primates after humans, ranging from Japan to Central Asia, to North Africa, to Southern Europe - 23 species in all. Among the largest monkeys, they lord it around in huge troops and troupes, getting up to a zillion monkey tricks, reaching two or more feet in height, and coming in various colours, from black and brown to grey and ochre. In densely forested Tangkoko-Batuangas Dua Saudara on the north-eastern tip of Indonesia's Sulawesi Island, a whole army of black macaques troops through the jungle on a morning romp to the sea shore, grooming each other, playing, jumping up into the trees, and generally monkeying about. Two young'uns start fighting and an older one rushes in to break it up. A little baby clings to the fur of its Mummy's belly. They have longish faces, huge canine teeth - all the better to eat you with - and hairless pinkish-red arse pads - all the better to sit down on. The males have sturdy shoulders and look somewhat like baboons. Even more simian are six French wildlife freaks; they have longish faces, huge canine teeth - well, not the latter - and are brandishing the most humongous cameras and tripods I've ever seen with dirty great escalating lenses larger than the Hubble Space Telescope. A male macaque clambers up one of their tripods and is busily inspecting it. Who's king of the tripod? On Borneo, the next huge island to the west, near the proboscis monkeys of the of the Sekonyer River, a large pig-tail macaque poses on a branch and grasps at tree trunks. It really does have a pig-like tail and is very muscular. The boatman says he hasn't seen one in this area in three years. They are dangerous, he says, because they can jump on you in a sudden attack, putting their huge biting canines and flesh-shearing claws to exemplary use. Generally even larger than macaques, baboons can reach up to four feet in length and 90 pounds in weight, prowling all over Africa and Arabia, sometimes in battalions as large as 250 or more. With five species coming in a variety of colours from dark brown and grey to olive and yellow, they're equipped with dog-like muzzles, close-set eyes, and like macaques have big hairless, reddish pink protruding pads on their arses to sit down on. 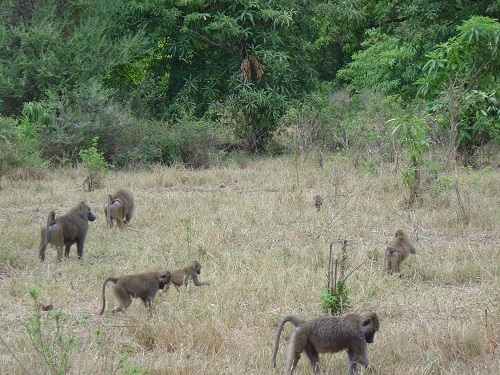 In the lush woods near Tanzania's Lake Manyara, at the foot of the Great Rift Valley escarpment, whole armies of yellow baboons are marching and charging all over the place. Babies jump up on their mothers' backs, crouching and clinging to the maternal fir when their mothers run but sitting upright like little horsemen in the saddle when their steeds slow down to a walk. 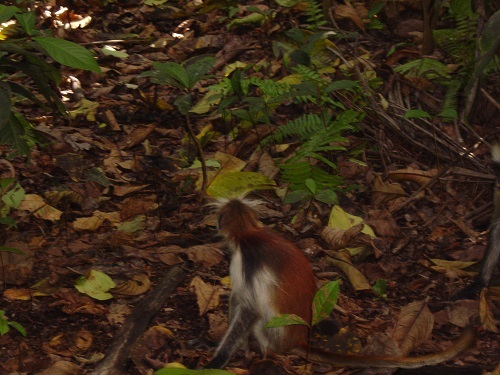 In Tanzania's semi-autonomous island of Zanzibar there's a small forest where large troupes of red colobus monkeys horse around, used to humans and continuing their monkey tricks with nary a gaze at intruders. 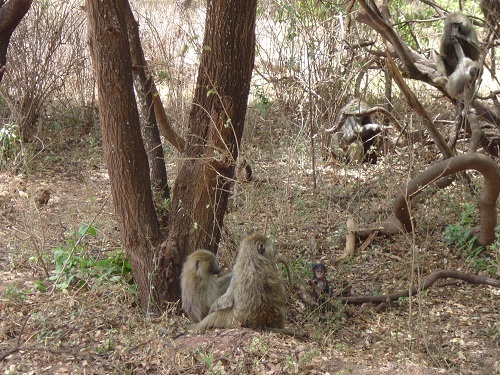 The younger ones wrestle and swing on branches when they're not pulling their parents' tails. The trees and bushes underneath teem with them as they jump from branch to branch and scamper over the ground. And what are you doing on the shores of Lake Victoria at Entebbe? In Tena, at the confluence of the Tena and Pano Rivers in Ecuador's Amazon rain forest, a mother monkey stands and walks several dozen yards over to her child on the grass - the first time I've seen a monkey go so far on two feet. In relatively nearby Coca, where the Napo meets the Coca River and the Mission hotel sports a disco in a de-winged jet cemented to a floating dock, teatime on the hotel terrace is watched by a family of three little monkeys - Daddy Monkey, Mummy Monkey and Little Baby Monkey. Suddenly Mummy Monkey pounces on my table, takes the top off the sugar bowl, then proceeds to spill it all over the table cloth, much to baby's delight. No, waiter, it definitely was NOT me! Further south, in a nature reserve in Puyo, I feel a tug at the back of my trousers, turn round expecting to see a dog, and find a monkey with a baby on her back climbing all over me, arms and legs everywhere, clambering to a perch on my head. I get a real idea of how prehensile a prehensile tail can be when she wraps it round my neck. Now one of her friends joins in the let's-get-muggins pillow-fight without pillows, and I have to be rescued by an attendant. I get my own back by tickling the infant, who opens its mouth in an angry-looking round hole, swearing at me silently. Much further south, on the Ucayali, a tributary of the Amazon in the Peruvian jungle, monkeys sit on the benches of the little dirt square in the indigenous village of Santa Clara as if they own the place. On the other side of the world, in Indonesia, a Thomas leaf monkey, with a cheeky crest on his head and quizzical look on his face, sits on a tree branch in northern Sumatra. And further south on the 1,050-mile-long island, in the Harau Ravine near Bukit Tinggi - a fantastic formation of twisting narrow cliff walls up to 350 feet high densely covered in vegetation, with emerald rice paddies stretching out on all sides - a pair of white-fronted monkeys have found a kindred spirit. They accompany Yours Truly half way up the cliff face to a panoramic view point, doing various monkey tricks, jumps, swings and other gravity-defying arboreal aerobatics as they also enjoy the view.